I’d have say it is me. I think you’ll enjoy this interview with a brilliant Catholic theologian and philosopher. Hope you join the Tea Party sanity in contrast to the socialist insanity. 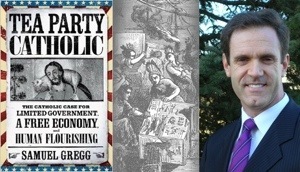 “In short, to be a “Tea Party Catholic” means that you reject the path of Rawlisan-Keynesian-New-Dealism, especially regarding its expansionist view of government. But it also indicates that you’re unwilling to live Amish-like in a Catholic ghetto. Instead you believe (1) there are many things about the American Founding to be celebrated by Catholics, but also that (2) Catholicism can help shape that experiment in the direction of truth, virtue, and what I (and others) call human flourishing. I would never claim that Tea Party Catholic articulates the only possible Catholic stance on such matters. But I do suggest it’s a legitimate position for a Catholic to hold.